2014 is drawing to a close, and the festive spirit is no doubt getting plenty into the gaming mood. We've already revealed our Game of the Year Staff Awards, but now it's time to see which titles have most excited the Nintendo Life community over the past year. We opened voting for the Game of the Year Reader Awards on 16th December, and thousands of votes have been cast as you selected your favourites. 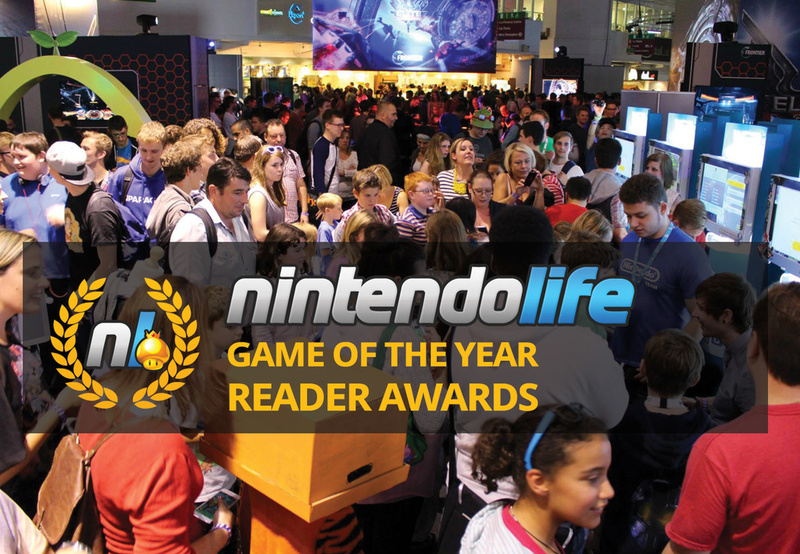 Unlike the staff voting, the community had the tougher job of selecting one game in each category, but as a testament to the quality of the 2014 line-up on Wii U and 3DS there were an impressive number of games that earned votes. Those that selected 'Other' as opposed to the shortlisted titles certainly had their say, too. These are your awards, then, so let's get to the details. This award followed the trends of the staff equivalents, with Donkey Kong Country: Tropical Freeze and Hyrule Warriors earning honourable mentions despite missing the top three. The final results, however, are a little different. Nintendo's blockbuster Holiday release, alongside the amiibo range, has clearly captured the hearts of Nintendo Life's readers. It saw off a spirited challenge from the second placed game, and shows that the hard work of Masahiro Sakurai and his team has succeeded in satisfying a lot of Wii U owners. One of the most intriguing categories as a result of the broad range of releases on the platform, this had plenty of titles battling for placings. Those that missed out from the top three by a handful of votes included NES Remix 2, SteamWorld Dig and Guacamelee! Super Turbo Championship Edition. To be blunt, this terrific platformer from Yacht Club Games won by a huge margin, picking up 44% of the votes in a diverse field. This is a title that's been acclaimed by many that have played it, with the developers picking up a host of major awards as a result; challenging, impeccably designed and with gorgeous audiovisual detail, this is an outstanding game on the eShop. Nintendo's portable is still the go-to system for millions, whether relaxing at home or getting in valuable play time on the road. 2014 brought us some excellent retail games, and the community vote has brought some clear differences from the staff equivalents, with one of the biggest franchises in the world earning a place that it previously missed. Intriguingly, we also have a top three entrant that picked up last year's now-defunct "3DS Retail Third-Party Game of the Year" reader's award, yet it was eligible again due to its 2014 release in North America. Honourable mentions that missed the top three go to Fantasy Life and Kirby: Triple Deluxe. A comfortable winner, the portable Smash Bros. entry secures the staff and reader's 3DS Retail double. Arriving before its HD brethren, this handheld release did an excellent job of warming us up for the home console game and, actually, stood very well on its own two feet. A technical marvel on the diminutive system, and another triumph for Masahiro Sakurai and his team. Like its Wii U equivalent, the eShop category on Nintendo's portable can lead to some particularly intriguing votes. It was another strong year on the store, and one title made such an impact on some that it claimed third place despite only being available in North America when voting was open. Special mentions go to Steel Diver: Sub Wars, Azure Striker Gunvolt and Retro City Rampage: DX, which all narrowly missed out on a placing in the top three. Just like in the Wii U category, this title absolutely ran away with the vote, this time with 46% of the total. It's clearly the stand-out download success story of the year, and due to its release on both Wii U and 3DS has achieved an unprecedented double double, securing the Wii U and 3DS eShop gongs in both the reader and staff votes. It's time for the ultimate award now, the game that you - the Nintendo Life community - voted as your Game of the Year across both Wii U and 3DS. Just like the staff votes this result shows that the wow factor has resided with the Wii U this year, with home console games taking the top three places. As for those that just missed out, we offer a hat tip to Donkey Kong Country: Tropical Freeze and Pokémon Omega Ruby & Alpha Sapphire. As per the Wii U retail category, the terrific fighting game from Nintendo executes a Final Smash to its rivals. Masahiro Sakurai and Nintendo made sure to emphasize that this HD début for the franchise also represented the IP's biggest game yet; it's difficult to argue. A huge roster, 8 Player Smash, innovative amiibo support, online matches that actually work, and a glut of modes make this a substantial package. There's more to come in 2015, too, with Mewtwo DLC and online Tournies on the way. Those are the Game of the Year Reader Awards for 2014, then. Feel free to let us know what you think of the final outcome, and share your own personal lists, in the comments below. An excellent list! I haven't tried out Shovel Knight though. Good thing I have a lot of money from Christmas on my 3DS/Wii U eShop account, so I will probably buy it. Last, if you haven't bought Super Smash Bros. for 3DS or Wii U yet, absolutely buy it. Some may think that it's overrated, but the game is so wonderful that no Wii U or 3DS game collection is complete without Super Smash. Also, the Amiibos are really cool; just don't wait to buy them or else they will get sold out in your area. woo for super smash bros for wii u. As a senior, (over 75), I need a little slower paced game. So excited that Fantasy Life was released this year! Different strokes for different folks! So... Super Smash Bros and Shovel Knight basically win every category. Cool. I was under the impression that Tropical Freeze got a lot of votes, there was a lot of talk about it anyway. So now I know why I can't find anyone online on the NL Mario Kart 8 tournaments. "Smash is the 2nd most boring game of the year"
That's so exaggerated it's invalid. And dear oh dear, I understand how great Shovel Knight is but Pushmo World, at the very least, deserves the #2 spot. And not even an honorable mention for Scram Kitty or Stealth Inc 2? I'm just gonna chalk that up to the fact most people haven't played them and therefore don't understand how fun they are. @JaxonH nice. I like your tastes. I suspected that Smash would win but there are so many other titles that deserve some love too. Games like Smash and Mario Kart are great and have very broad appeal, so usually when it comes to GotY picks it's the lowest common denominator that wins. Tomodachi Life not even in the Top 3 this time? Wow. I really liked that game. I agree with everything else though. I'd expected Fantasy Life to be placed higher. One of my all-time favourite games and definitely my GOTY of an already amazing year for gaming. I would have liked a little more bayo love but meh, also persona Q could have used a foot note game is fun. Well I saw this coming. Way to get it wrong, readers. Watch dogs was game of the year for me! My GOTY's aren't even mentioned. @DBPirate Tomodachi Life is a good game! I loved the interaction you could do with your residents. MK8 was my GOTY but I have to admit I love Smash, of course. I think these two articles have finally convinced me to get Shovel Knight. Wii U or 3DS though? @Murchuda I definitely like the slower paced games like Fantasy Life, Animal Crossing, and Harvest Moon! My dad is 75 but I can't convince him to play video games; he said he tried when he was younger and he wasn't any good so he he just gave up. I'm glad not everybody his age shared his attitude! People sure do love their Smash Bros. I guess. Also Shovel Knight was pretty much the only great game released on the eShop this year, so that's not really a surprise. Oh wow, Ace Attorney again! Sad Layton Vs Phoenix didn't make it, but still a great list! Expected. I disagree, but expected. Shovel Knight and Smash Bros steal the show. MK8 2nd, Bayonetta 3rd. There is a noticable lack of Captain Toad in this list. Disappointing to see that Professor Layton vs. Phoenix Wright: Ace Attorney didn't get a mention, especially considering its hype. That game was fantastic, and one of my favorites for the year. It wasn't perfect, since some of the puzzles were a little easy and some of the voice acting wasn't great, but the overall package of gameplay and story was amazing! Being a pokefan, I would have chosen OR/AS as best retail 3DS game. But effectively having only 2 games on the entire list doesn't show that much variety. Super Smash Bros deserves it's 1st place, it's the best 2-8 player game you can get (OK, Melee might be better 2-player game but for the rest 3-8 I'll go for SSB Wii U). Mario Kart 8 being 2nd is a real surprise to me. That game is so slow and the track design is mostly worse than in the past titles. Donkey Kong Tropical Freeze should have taken it's place. Bayonetta 2 deserves it's third place. As for downloadable titles... Shantae hasn't arrived to Europe yet and we had to wait so long for Nintendo release (my friend played the Steam version in summer) but it was worth the long wait. There might not be that many releases on Nintendo systems yearly but for me they're golden. 2015 is going to be another great year for Nintendo players. It was expected for Smash, but I like MK8 better. Maybe it's because I don't have that gamecube controller. I also like Fantasy Life and Bravery Default for the 3ds better. The masses are the masses. I haven't picked up yet is Shovel Knight. I Probably will later. The smash bros franchise is riding on the success of SSBM. On its own, Brawl is horrid and Smash WIi U is decent, but not GotY. Reader Awards? This is the first that I have heard about this. Though I do get extremely busy when December starts and don't have nearly enough time to read all the announcements here as per usual. I guess that explains it. People are upset Smash won because it's the "boring" pick everyone expected... But isn't that the point? The game was so great and popular that it was obvious what people would choose. Why would we pick a lesser game just for the sake of it not being obvious? Yes, there were several other great games like Mario Kart 8 and Bayonetta 2. But no other game matches the sheer amount of content, replayability and general amount of fun and love that Smash has in spades. Sorry if the pick is a boring one, but that doesn't make it the wrong one. Games that are head-and-shoulders above all others are always the obvious, yet correct, choice. @bizcuthammer I don't mind that it won so much as it won 3 times. It should've been in only one category. Same with Shovel Knight. Might be time to pick up a copy of Shovel Knight. wow, I think it's really time I left and came back in 6 months when all the smash fury has died down, theres nothing that bores me more. @Ren We'll miss you maybe i don't even know,maybe i'll have a party?Or maybe i'll do something maybe someone here will remember you?Anyone?No?Okay bye friendo. I feel Game of the Year doesn't fully capture the greatness of any game in particular. Its basically which one has the most widespread appeal. Scram Kitty and Pushmo World should have been in the top 3 WiiU eshop games. Smash Wii U: aka, the most overrated, overhyped game in years, if not decades. Not only is it not in the top 10 for games of the year, it isn't in the top 25. Such a shame that fan service for an underachieving handheld and a dead fish could beat out other, genuinely engaging and entertaining experiences. Then again, as gaming is less about doing anything or accomplishing something significant than ever before, it's not surprising that Nintendo would roll out stuffing over turkey. I paid $60 for Smash and... it is not as exciting as Captain Toad... I guess you really need to be a fan of fighting game before liking Smash. To me, Smash is all about fighting with people — the one-player mode is pretty boring. Shovel Knight is not the best platformer I have played. If you play PC, Jet Gunner is better. Most nintendo fanboys already declared Smash GOTY before its release or even playing it, so no surprise there. @CanisWolfred That makes literally zero sense though. Just started child of light and it is a beautifully put together game. A highly deserved bronze medal! Bayonetta 2 got third place...I am happy that there is at least some love for it. But no Kirby on the 3DS section?! Ah well. Congratulations. @Jazzer94 It makes plenty sense when you're only giving out 5 freakin' awards. No surprises here, but as I've said before, it was Tropical Freeze for me this year. Hands down. @Diddy_kong I like your style! @Murchuda I want to be you when i'm 75!! You mean... Battleminer isn't GOTY? .... what? Bayonetta 2 actually offered new and fresh gameplay and a strong new flavor to the Wii U, but people heavily voted in favor of the same old predictable fare again--DKC and Smash Bros instead. That's a shame. There will be no Bayonetta 3 on Nintendo consoles. @Quorthon We were lucky to get a sequel to start with, no-one cared about the original game until the sequel was announced as a Nintendo exclusive. It's got people's attention and has won multiple awards. There'll be another, most likely on a Nintendo console.